Any Mom, Dad or member of the household who spends a considerable amount of time in the kitchen preparing meals will testify that not all kitchen knives are made equal. If outstanding and hassle free results is what you are looking for when gutting a fish, dicing veggies, chopping onions or slicing chunks of beef, it becomes imperative that you pay attention to some features of any given knife before buying. This will not only ensure that you have bought yourself an efficient long lasting blade, but more importantly, it will serve to perfection the very purpose for which you bought it for. When we say that not all blades are made equal, it is because there is a sea of knives out there in the market place today but only a fraction might meet your expectations in terms of durability, efficacy, ease of sharpening and ability to stay sharper for longer. If you are like most people, you are probably not an expert on knives and any gleaming blade with a decent handle off the supermarket shelf seems good enough. Before you realize it, you are scouring the same supermarket shelves all over again looking for another knife because the one you bought does not seem to be functioning at the level you were hoping for. This time round you settle for one with even more sheen on the blade in hope that it will yield better results in terms of performance to no avail. There are several brands in the kitchen knife sphere today that would make any chef smile with glee at the amazing care, precision and thought that has gone into crafting the knife. These brands churn out knives that score highly in terms of durability, ease of sharpening and efficiency in the kitchen. They honestly transform ingredients prep from a horrid chore to a pleasurable experience. In this article we examine two top kitchen knife brands that have a stellar reputation of producing phenomenal knives. They have two things in common: they are masters of forging steel blades and they have been doing this for centuries, across several generations. I am talking about none other than Wusthof and Zwilling. We begin with an in depth review of these two brands and sample a popular knife from each camp to see why they have become synonymous with quality and longevity whenever the kitchen knife conversation comes up. The Wusthof Brand symbol is a trident in a circle. It’s their trademark of quality that you can expect to see on their knives as well as other pieces of cutlery. Although Wusthof is popularly known for its numerous knife series, they also manufacture other kitchen accessories such as spatulas, meat forks, scissors, whisks, knife sharpeners and skimmers just to name a few. The Wusthof brand has been in existence since 1814. That is a whooping 204 years to date of manufacturing phenomenal blades. Although the brand is headquartered in Solingen Germany, also known as the city of blades, it is interesting to note that at the time when the Wustof brand was being birthed, Germany as we know it today had not come to existence. But don’t just take my word for it, the next time you are out knife hunting, be sure to check out this brand on the knife section and see the exquisite finish and aesthetic design. You would probably not mind if it graced and adds grandeur to your kitchen. Wustof is defined best by their core values of passion, diligence and perfection. These can be clearly seen on each class of knives from their extensive range that have served varied needs in the kitchen. Whether you need a good blade fashioned for deboning, chopping or gutting a fish, Wusthof seems to have you covered. Their knives area aimed at aiding in your every kitchen meal prep needs. Epicure – this a line that features sustainable luxury as the handles have a woody look made from composites of recycled wood called Richelite. Ikon – the Ikon line comes with a sassy Grenadil wood handle. The blade is forged from high carbon stainless steel and is quite easy to keep the edge sharp. Classic Ikon – the classic Ikon line offers well balanced blades forged from stainless steel. Classic – the classic line is one that comes with a black composite handle that is most preferred by chefs both at home or professional. Grand prix II – this line of blades are built with long- lasting sharpness in mind. The blade has been forged from high carbon stainless steel. Gourmet – the laser cut manufacturing style used on the gourmet line of knives ensures distinct sharp edges. Pro – the Pro line of Wustof knives has a uniquely shaped hygienic and ergonomic handle which is ideal for the professional chef. Just by the mere look and feel of theses authentic knives, it becomes clear that there is no effort spared in crafting a perfect knife by the Wustof Trident brand. 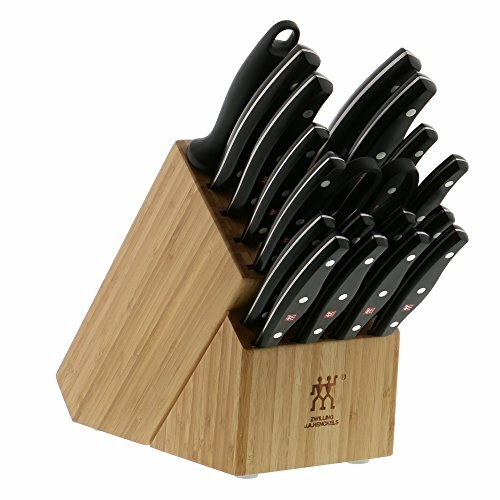 It is of little wonder that the brand carries such clout when it comes to lovers of magnificent knives for your kitchen. Now we take the time to single out one of Wusthof’s knife for review. This will allow you to see the finer details that make this brand one of the best. Now that we have established the values and dedication ingrained in each of Wusthof’s knives, we delve right into the features of what makes this blade and handle so special. We chose the Wusthof 8-inch chef’s knife particularly, because of its popularity and versatility. It happens to be the best seller in the classic series. It is also the type of knife you are likely to find in an ordinary kitchen owing to its ability to mince, slice, and chop, in addition to its great balance for cutting thicker chunks of meat and veggies. When it comes to prepping ingredients in your kitchen, this knife is quite the workhorse. The forged stainless steel on this blade has been tempered to 58 Rockwell, meaning it’s very, very durable. The blade is forged with precision from a single piece of high carbon stainless steel that is corrosion proof and stain resistant. This blade utilizes a precision edge technology that is nothing short of magnificent. Also known as the PEtec, this technology ensures that the blade is 20% sharper and maintains that sharp edge twice as long compared to an ordinary knife. The handle is made from polymer giving the knife a sleek look. The full tang of the knife is fitted with a polymer handle and triple riveted to form a hygienic and seamless durable handle. Safety is high on this knife design. This becomes evident from the full bolster that helps safeguard your fingers while enhancing comfort and control. One of the true hallmarks of quality is when a manufacturer is confident enough to give you, the consumer, a lifetime guarantee on their product as is the case with Wusthof’s knives. 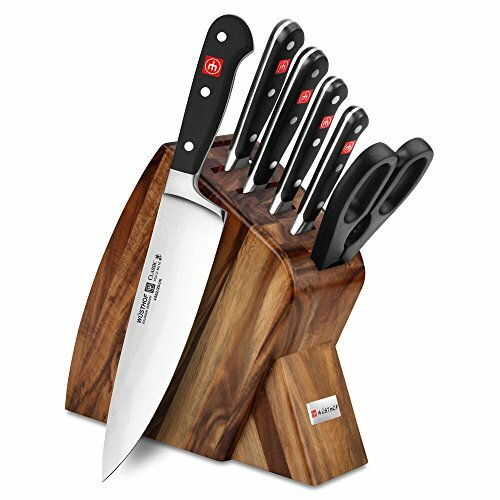 Having one or a set of these knives with a block in your kitchen, you can be sure your food prep just got easier and it will remain so for a very long time. If you were astonished at how ancient the Wusthof brand is, then you best hold on to your jaw lest it drops to your kitchen’s linoleum. The Zwilling JA Henckels Brand is far much older!! Founded in 1731, this company is also headquartered in Solingen Germany. It is now becoming clearer why the quaint city of Solingen is known as the city of blades. Zwilling products bear a twin logo as their trademark. This logo can be seen on their knives as well as general kitchen ware. Although the brand is famed for its knife product line, it is also well known for its authority in manufacturing outstanding quality cookware, gadgets and tools, beauty items as well as table ware. Over and above manufacturing of exquisite kitchen knives, Zwilling’s general product range is far more elaborate as compared to Wusthof Trident. These products include glassware, pot and pans, shears, woks, wine accessories, chop sticks as well as storage tools just to name a few. If you are looking to brighten up your kitchen and dining table with a fall feel, then you are likely to fall in love with Zwilling’s Staub collection. Zwilling are maestros in forging knives and they have been at it for 287 years to date. Considering that this is 13 years shy of clocking 3 centuries, you get the feeling that their knives are not just ordinary blades. They have been forged or stamped from high carbon stainless free steel and crafted in a masterful process that is unparalleled. In the 1900’s the royal court of the Austria and Hungary, accorded a royal warrant of appointment to Zwilling as their official purveyor of knives. This speaks to the consistency of high quality and aesthetics of Zwilling knives that did not go unnoticed by the highest echelons of society. Now even you can have a piece of royalty in your kitchen with Zwilling knives that were fit for a king or queen. Zwilling JA Henkel has several knife brands under it all made with the excellent quality that we have come to know and love them for. These brands offer numerous styles that are appealing a broad range of tastes, touching on Japanese knives and Euro-American knives. In order to bear closer scrutiny, as to what makes zwilling’s knives quite extraordinary, we sample one of Zwilling’s popular knives which is also considered as a veritable kitchen work horse due to its versatility. The Zwilling Pro 6.5 hollow edge Nakiri knife. This knife bears the trusted twin logo that is Zwillin’s trade mark. It is arguably one of the most if not the most user friendly knife in a kitchen arsenal. The knife is a culmination of more than two and a half centuries of perfection in the art of knife making and rigorous study on the use of the knife. The full length, from bolster to the tip of the blade is sharpenable and the entire blade can be used for cutting. Exceptional blade design for cutting, dicing and slicing functions in the kitchen. The hollows right above the edge of the blade prevent foods from sticking to the blade. The blade is forged and ice hardened from high carbon stainless steel and therefore does not corrode. It is also stain resistant with amazing durability. The presence of a uniquely curved bolster ensures safe cutting and supports the professional pinch grip while reducing fatigue on the thumb and index finger. Full tang with a hygienic three riveted handle that follows the contour of the tang for a seamless classy finish. We love the fact that the design appreciates different cultural cutting motion styles. This touch of thoughtfulness is no doubt a factor as to why the Zwilling Pro 6.5 hollow edge Nakiri is one of the best sellers for both Euro-American and Asian markets. Pitting Wusthof’s knives against Zwilling’s knives is tantamount to the clash of the titans. The products of this two manufactures have demonstrated consistent quality in their knives that it makes it very difficult to choose one over the other. It seems to me that it boils down to a question of personal preferences in terms of aesthetics, feel and style. Q: What is the sharpening of angle Wusthof knives? A: Most Wusthof’s knife blades sharpen between 10-14 degrees. Be sure to read you knife’s manual for precise sharpening angle of a given wusthof knife as they may vary slightly from one knife type to another. Q: What is the sharpening angle of Zwilling knives? A: Most Zwilling knife blades sharpen between 10-20 degrees. However, it most prudent to consult your Zwilling’s knife manual for a precise sharpening angle pertinent to a specific knife type as they may also vary slightly from one knife type to another. Q: What is the hardest blade on Wusthof’s knife series? A: This has to be wusthof’s classical cook’s knife which is tempered to 58 Rockwell. Q: What’s the hardest blade on Zwilling’s knife product line? A: This undoubtedly has to be zwilling’s twin cermax M66 which packs a hardness of 66 Rockwell. Q: Do these two manufactures sell knife sharpeners? A: Yes, they do sell their own branded manual, electric sharpeners as well as whet stones and honing rods. When you own knives of such a caliber, it is recommended that you also get knife sharpeners from the same brand as you would have assurance that the quality of the sharpener is evenly matched to your blade. Besides, you would not have to fear messing your most prized and precious wusthof or zwilling knife as a result of using a mismatched knife sharpener. Wusthof and Zwilling knives are the very epitome of quality carried over several generations. Clearly, not all knives are made equal and these two brands reign supreme when it comes to not only giving you a broad selection of knives to suit many kitchen purposes, but also in providing you with effective and durable knives. No matter which brand of the two you settle for, these knives will no doubt add a touch of grace and class to your kitchen, while making your cooking prep a breeze. The trident logo and twin logo offer a lifetime guarantee on their knives that makes them extraordinary and sets them miles apart from all other knives. They are a very worthy investment for any kitchen worth its salt.